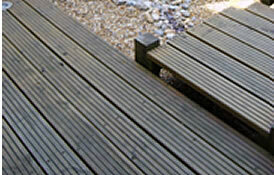 Pressure-treated timber is, for many of us, the obvious choice for long-lasting and weather-proof wooden materials and equipment in our gardens. Since 2004, however, CCA (Chromated Copper Arsenate) pressure-treated timber has been banned from use in residential and public space applications in the EU and US due to concerns over the leaching of the arsenic into the soil. But this doesn’t mean that CCA pressure treated wood was banned outright. It can still be used in industrial, agricultural, marine and civil engineering applications and CCA pressure treated wood may also be imported from outside the EU (for use in the above types of professional applications only). 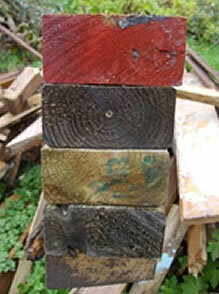 Pressure treated wood sold before 2004 may contain CCA, a hazardous chemical compound containing arsenic. In addition, the ban did not require pre-2004 pressure treated wooden materials, decking, fencing and other features to be removed from gardens and play areas. Consequently, the risk of arsenic leaching into the soil is still an ever-present environmental hazard in our gardens. As these structures reach the end of their lives and begin to break down, it will be important to dispose of the affected wood carefully and safely. Avoid growing edible crops in areas that were underneath or near old wooden decks, benches and picnic tables (or in raised beds made form old treated timber). It’s also advisable not to pressure wash or sand down older (pre-2004) decking, fencing and wooden equipment to reduce the risk of releasing the arsenic compound into the atmosphere. There’s one creature that a gardener often gets to know quite well – the remarkable robin (Erithacus rubecula). As it holds its territory year-round, it is quite a distinctive creature and is a welcome sight during the bleaker winter months. Familiar to many of us on Christmas cards (often pictured perched, appropriately, on a fork handle), the feisty robin is the UK’s favourite bird. 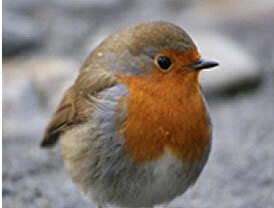 The red breast is present in males and females (but not young robins) and is linked to their need to vigorously defend their territory against challengers. Securing and holding on to a good territory is important as it ensures the robin a continuous supply of food. As a high proportion of robins succumb to starvation, cold and disease at this time of year, try to ensure a regular supply of food for them during winter months. Needless to say, we gardeners often help at this time of year by bringing worms to the surface when digging over the soil! The climate of North Wales is generally benign – mild and wet in the summer and cool and wet in the winter (usually). The gulf stream’s effects are still felt here, especially along the coast, and many plants that would be at home in the Isles of Scilly, and even Madeira, will grow well where they are reasonably sheltered and sited near the coast (at Portmeirion and Plas yn Rhiw, for example). Further inland there is a wide selection of wonderful gardens from the grand to the modest, the mountain slope to the water’s edge. Plas Brondanw makes the most of breath-taking mountain scenery beyond its boundariesand the generous terraces at Bodnant are filled with wonderful year-round plants and trees. The Ribbonwood tree is a flame-shaped, fast growing tree that has the appearance of being deciduous on first sight (due to its pale, limey- green leaf colour). It can grow up to a metre a year in its early years and can cope with close planting (good for hedging). Small white, star-shaped flowers that are subtly fragrant, appear in early summer. An under-rated evergreen tree. The Kohuhu tree is an attractive, crinkly-leaved tidy-looking tree from New Zealand, and grows to 6m in height. It needs a sheltered site away from drying winds. Its dark stems set off the mint green / grey and shiny leaves. Dark red / purple and scented flowers, foliage lasts well when cut. This striking tree bears white flowers in summer and red berries in Autumn. A lax, zig-zag habit from arching branches gives it a dishevelled appearance but it is low maintenance and tolerates many soil conditions. Plant away from other trees. The Strawberry Tree grows slowly to 5m high. It has a fine, rounded open habit, ideal as a focal point. Panicles of red pink flowers open at the same time as edible strawberry-like fruit (from the previous year) in Autumn. Lovely red / brown bark. This fresh-looking holly has golden, yellow edged leaves with dark green centres. It grows to approximately 6m high and has a rounded, lollipop shape. Insignificant white flowers appear in spring, berries from autumn onwards. Fully hardy. With the ‘cosmic builders’ in (that’s another story! ), the front garden of the property has changed beyond recognition. The front lawn and parking area have been overrun with skips, piles of rubble, timber, plasterboard and unsightly bags of building materials since October. A new water pipe trench has created huge mounds of clayey subsoil riddled with stones and rocks. Winter months will now be filled with making new paths and patios at the front. The larger stones will be used to create several new terraces and raised beds in the back garden. In July 2010 I celebrated my first decade of self employment. To mark the occasion, I invited clients from the past ten years to let me know how their garden had impacted on their lives. These poignant insights affirm for me the amazing capacity that our gardens have to support and strengthen our lives. I include the full comments of all the contributors on the website (under ‘Writer’ and ‘Articles’). Many thanks to all my clients and colleagues, past and present, for your support and encouragement. Did you know that 38 degrees is the tipping point for avalanches? It’s also the name of a website that brings people together to enact change through campaigns, petitions and networking. Three new species of whitebeam have been located in a tourist attraction in Somerset. Cheddar Gorge, a popular beauty spot, is renowned for its steep and inaccessible rock faces. Using latest DNA technology to determine the differences in the new species, the three are: Cheddar, Sorbus cheddarensis, Gough’s Rock, S. rupicoloides and Twin-Cliffs, S. Eminentoides. Phytopthora ramorum, a fungal pathogen responsible for ‘Sudden Oak Death’, has recently been discovered in Japanese Larch (Larix kaempferi) growing in Wales. This is considered an alarming development as it was believed that the pathogen was limited to a narrow range of ‘host’ plant species, notably Rhododendron, Camellia and Viburnum. Consequently, Forestry Commission Wales (FCW) has issued a moratorium on the felling of Larch until the end of 2011. The FCW strategy is to wait until spring 2011 when the Larch is flush with new needles to map the extent of the spread of the pathogen across the country.